Abstract: With competition heating up between manufacturers and their PC3700/4000 memory modules, Corsair have released the XMS4000 dual channel DDR series. When Intel released the popular i865PE/i875P chipsets along side the 800 MHz FSB Pentium4 processor, the game changed forever. Before this precipitous event, enthusiasts could never have thought about about sacrificing a memory module's latency for more bandwidth, but these days P4 "C" users running 300+ MHz FSB, bandwidth is king. 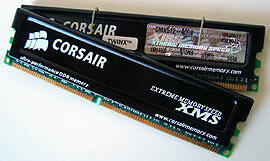 Any experienced geek should be familiar with the name Corsair, after all they've been producing memory geared at the cream of the crop since 1994. With competition heating up between manufacturers and their PC3700/4000 memory modules, Corsair have released the XMS4000 dual channel DDR series lest they risk falling behind in the eyes of consumers. Today we're going to be looking at the flagship Corsair TwinX1024-4000 memory. These twin DDR modules are rated to run at an amazing 250 MHz FSB, however that is with latency set at the rather lax JEDEC PC3200 standard timings of 3-4-4-8. To achieve this speed the voltage supplied to the memory must also be increased to 2.75V. When we removed the black aluminum heat spreader on one of the 512MB TwinX-4000 DIMMs we were greeted with 16x 256Mb Hynix DRAM, specifically HY5DU56822BT-D43. According to Hynix, these DRAMs are officially rated to run at 200 MHz with timings of 3-3-3-8 and a default voltage of 2.5V. I know some of you out there might wonder why Corsair are selling 'pre-overclocked' memory but does it really matter if the XMS4000 runs at the rated speed? We first installed the XMS4000 memory into an AMD test system and changed the memory timings to the most aggressive in the BIOS. Unfortunately, we were met with some difficulty as the memory would not run at 200 MHz FSB with 2-2-2-5 timings. After playing around with the timings, and setting the memory voltage to 2.77V we were able to run the memory at 2-3-3-6, at 200 MHz FSB which was not very encouraging. Slowly we started to raise the FSB and at around 215 MHz we ran into a few stability problems but increasing the memory voltage to 2.9V solved that quickly. In the end we were able to hit a maximum speed of 223 MHz FSB on our Epox 8RGA+ test motherboard. Raising the timings to 3-4-4-8 did not help us overclock even 1 MHz higher. On the Intel side of things, we plugged the memory into an Abit IS7-G test system and started to tinker with the timings. As with the AMD test system, even at 200 MHz FSB we were not able to run the Corsair TwinX-4000 memory at 2-2-2-5, in fact we could only run 3-4-4-8! Using a P4 2.4C processor I immediately raised the FSB to 250 MHz and to my surprise everything worked just fine! Feeling lucky I went up a bit higher on the FSB, but ran into stability problems. Raising the memory voltage to 2.8V solved everything and with the Intel test system we were able to hit a nice 258 MHz FSB! It looks like these days more and more memory modules are tuned to run on Intel systems.